It is certain that Italy’s interior minister Matteo Salvini will not conduct a census of Romani people in Italy. His proposal earlier this week caused international outcry, garnered Salvini a new burst of global media coverage, following hot on the heels of his earlier bid for infamy, when he refused to allow a ship that had rescued African migrants to dock at Italian ports. Salvini’s declared intent to carry out a Roma census, followed by mass expulsions of those who don’t belong, was quickly dismissed by governing partners, the Five Star Movement as unconstitutional. For now it seems that the rule of law will prevail over the rule of mobsters from the far-right League. But it would be obtuse to imagine the danger has passed. 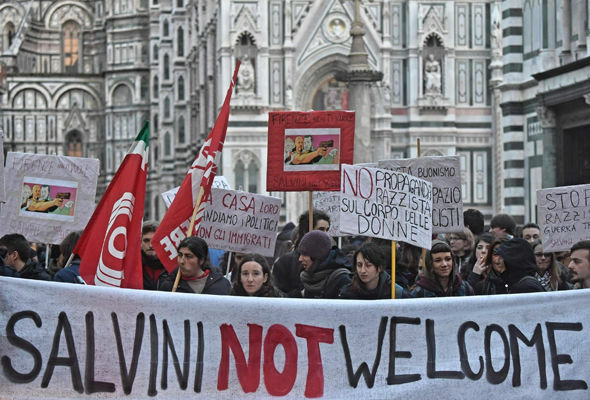 For this is just the latest salvo in Salvini’s bid to become the most powerful politician in Italy, and to serve this end Roma, migrants and refugees will be scapegoated without scruple. Lest there be any doubt about the racist intent and Salvini’s deep contempt for Roma, Salvini told a television interview, “Irregular foreigners will be deported via agreements with other countries, but Italian Roma unfortunately, we have to keep them at home.” It’s a sick and sorry state of affairs, when it’s a matter of regret for an interior minister in a European Union Member State that he cannot expel his fellow citizens from the country. We have been here before – Berlusconi’s ‘Nomad Emergency’ with its demonization of Romani people heralded a prolonged period of harassment, expulsions, mob violence and pogroms against Roma communities. Lasting from 2008-2011, it served only to exacerbate communal tensions, legitimize human rights abuses, and inflict irreparable damage to any prospects for social inclusion. When the Northern League interior minister Roberto Maroni announced plans to fingerprint Romani children in June 2008, the move was widely condemned across the political spectrum as racist, unacceptable and discriminatory. Recalling Italy's fascist past, and the 1938 legal census of all foreign-born Jews which prepared the ground for the racial laws, Amos Luzzato told La Repubblica: "I remember as a child being stamped and tagged as a Jew … Italy is a country that has lost its memory." The European Roma Rights Centre challenged the State of Emergency decree before the Italian courts, and on 4 November 2011, the Council of State ruled that the emergency decree was unfounded, unmotivated and unlawful. In May 2013, Italy’s Cassation Court rejected the government’s appeal and upheld this ruling. In December 2016, the Committee on the Elimination of Racial Discrimination (CERD), called on the Italian authorities to halt all further evictions of Roma, and to scotch any plans to establish new segregated camps. These conclusions came on top of evidence of discrimination provided in submissions from the ERRC, Amnesty International and partner organisations in Italy, and followed “expressions of concern” from Strasbourg bodies at the increase in xenophobia and antigypsyism. The widespread and commonplace use of intolerant and racist language in political discourse and media outlets provided sobering reminders that years later, Roma are still suffering the consequences of Berlusconi’s illegal “Nomad Emergency”. Thousands of Roma families still live in ethnically segregated camps across Italy, often in remote areas far away from basic services. Many of the sites are unfit for human habitation, adjacent to waste dumps, toxic landfills and airport runways. And amidst the squalor, old and young alike live under constant threat of repeat evictions. The disarray of left and liberal political forces is a particular cause for concern. The lessons from fellow EU member states Hungary and Poland are clear: a determinedly illiberal government can capture the state – dismantle checks and balances, suppress media pluralism, and deliver on its pre-election promises to exact political, moral and economic vengeance on its ‘internal enemies’ – largely unhindered by EU institutions. The European 21st century authoritarian template has been cast, and xenophobia and racism feature large. There was no doubt that the victory for far right and populist forces in the last election spelled trouble for the Roma and a revival of the toxic xenophobia that characterized the Nomad Emergency. But Salvini spells danger: his disregard for the rule of law, his virulent nativism and racist determination to scapegoat the Roma smells like fascism.